Thank you for your patience with Typepad being down, then up, then down again. They have been working diligently and tirelessly to work out the trouble. Thank you to them for doing so, and for you for sticking with us despite the trouble! Orange is the happiest color on earth. For me. My mom, on the other hand, finds it dreadful. I bet you can guess that it shows up in my scrapbooks more than hers (if she scrapbooked, that is...). I wear a lot of orange. Solids, usually. I decorate with in in small doses. Usually in patterns, oddly enough--chevron, stripes, ginghams--any will do. Interesting that there is a difference in there between decor and fashion. I wonder how that translates to my pages. but even those aren't really oceans of orange as much a bigger puddles. I also realized that I often pair orange with blue/tourquoise. Perhaps because they are my happy colors??!! That duet came as no surprise! I hope you have a happy sunshine-y day bathed in radiant orange! Tomorrow is yellow day. See you then! and the giveaway goes to. . .
Congratulations to Jen! and thank you to all who commented. Jen, please email us with your contact information at writeclickscrapbook at gmail dot com! We look forward to hearing from you shortly. While we realize that September is still one day away, we couldn't wait any longer to show off our brand new gallery! This month our theme is Palette-able: each of us began with a color palette and grew it into a lovely layout. We hope you enjoy the gallery! As a reminder, a larger version can be seen and the journaling read if you go to the photo album. My "Palette-able" layout is full of my favorite colors. Especially mint color reminds me of FRESH and SOFT mood. I used circular stitch, bubble patterns and clear dew drops to accentuate the mood. It looks just like such a dreamy layout. One of my favorite color palettes is yellow and gray together. Just those two colors look so sunny and happy. 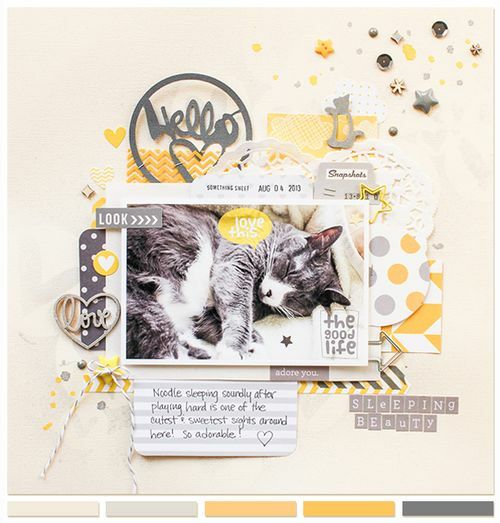 When I decided to scrap a really cute photo of my gray cat Noodle taking a nap, I knew I had to use the gray & yellow color palette! Every year my husband Todd and I looking forward to September because that's the start of the college football season, and we love our Ohio State Buckeyes! The inspiration for the colors I used on this page was drawn from the photo, in particular the green and orange of my t-shirt. I didn't really have anything in my supplies that matched those colors, so I created my own palette. In addition to green and orange, I chose pink and blue, and colored some of the circles on my background paper using watercolors; I customized the mistable embellishments with the same colors. Then I added some silver accents to have some sparkle. Summer has flown by especially fast for me this year.. but I am looking forward to the cooler weather! But with the fall approaching, it also means that I need to start working on the yearly calendars I give to my family as Christmas gifts! This month, my baby turned seven! It’s always bittersweet for me whenever my kids have a birthday so I wanted to document how she is at this moment in time. 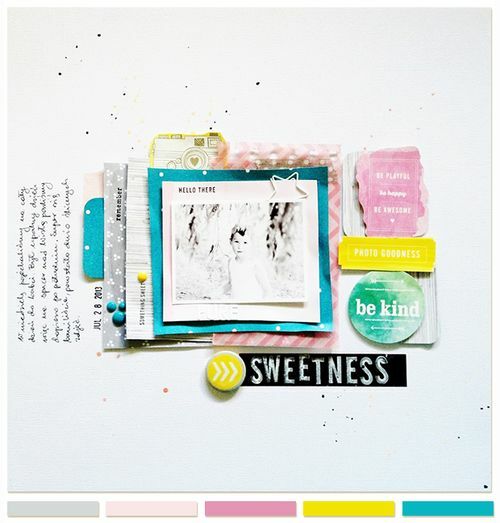 I love colours so when I saw this palette on Pinterest, I knew right away that I had to use it on a layout. I picked several papers and elements that matched the palette and digitally recolored other items that I liked but didn't match. I love to read fiction but I can’t stand to wait until the end of the book to find out the ending. Usually, I read books in this order: beginning, end, middle. I find that knowing the ending helps me catch more details as I’m reading through the book! This layout came together pretty quickly for me. I opened up my monthly kit from Cocoa Daisy, and there were so many greys, I was in heaven. I just started layering them on top of each other and then added in the orange for a nice masculine contrast. Since I live with all males, I find myself turning to orange and red a lot to add color to my layouts. Right before I made this layout, I painted my bedroom in grey, and I have been searching for some orange accessories to go with it. I guess I am a fan of this color scheme. 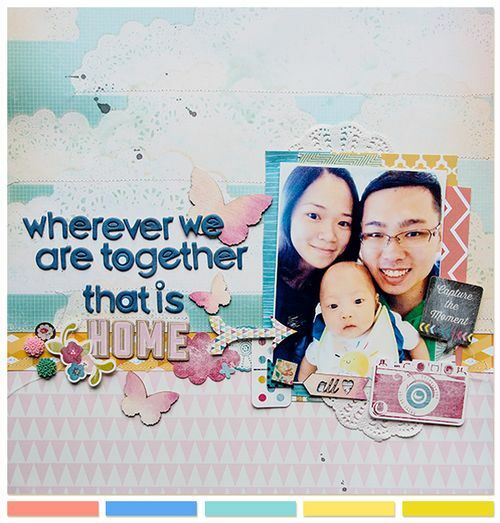 With the theme of palette in mind, I jumped on the recent trend of digital scrapbook stores offering multiple kits with a common palette. In this case, the September Company Stache from Pixels & Company. 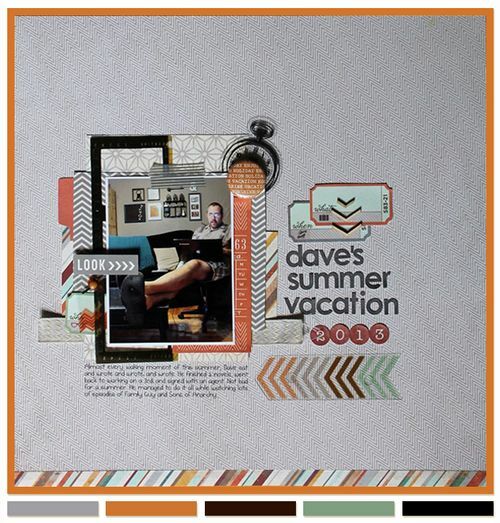 These collections of kits are a great way to mix and match designers and really come up with a little more eclectic mix of elements on your pages! Back to the crazy busy schedule of fall! It's amazing how much we can pack into four little lives! 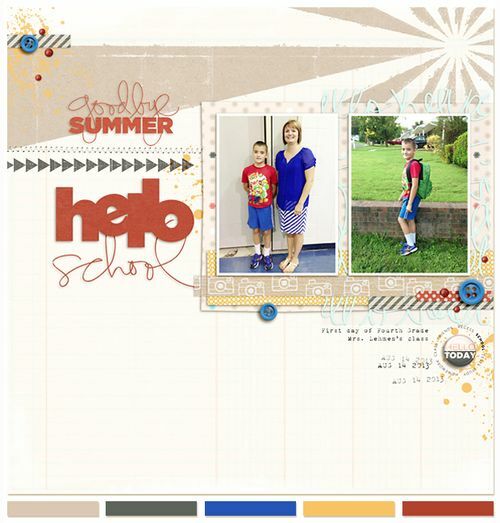 When choosing the colors for my back to school layout, I wanted to include the school colors of blue and gold (yellow). I didn't plan that my son was wearing blue shorts, or that the teacher's outfit matched perfectly! Since the photos had so much blue, I kept it as an accent color. I also wanted to tie in the red of my son's shirt, which also completed the triadic color scheme of the primary colors, red, yellow and blue, reinforcing the school theme. To balance the bright colors, I used neutrals of tan and gray. I kept the main colors in small amounts to enhance, not detract from, the colorful photos. After 14 years, I was excited to finally buy new bedding for our bed - gray comforter with gray and white chevron sheets and aqua accents. The best compliment came from my son, who said it looked like a "hotel" bed (made up with all the accent pillows). I am loving gold/copper right now and knew I wanted to include that color in my palette. 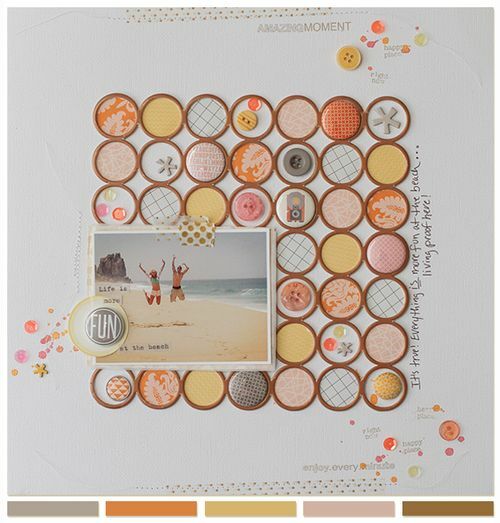 I found a fun gold metallic circle grid and knew it would be perfect for the theme this month. Putting it together was easy, I simply filled each circle with soft shades of orange, pink, yellow, and grey patterned paper along with some embellishments for added dimension. Christmas is just around the corner and I'm already planning the design for my Christmas cards. I think the photo on this layout will be the star of the card along with a clever title about jumping. 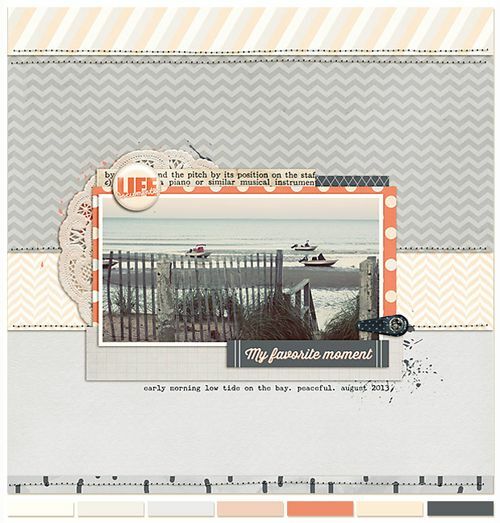 This layout is inspired by a colour palette that I found on the WCS color board at Pinterest here. I loved the soft palette, so knew I wanted to use baby pictures for my page. I found patterned papers in pink and yellow, and added the other shades with the embellishments. Can you believe that little baby is starting his second year of pre-school this month? I had a great photo of my father-in-law with my two boys from our vacation this year. It made me think of everything they have in common, which inspired the journaling. For the colors, I went with a palette largely of yellow, orange, aqua, and green. I started with the background paper in my favorite color, yellow. I then went with the speech bubble paper, which had orange, aqua, and green. I picked the title die cut and embossing powder in orange, used the washi in aqua, then stitched in green to emphasize those colors. Orange, yellow, and aqua are my favorites, and the green I think made the color combo stand out. I can navigate the Mall of America without a map. 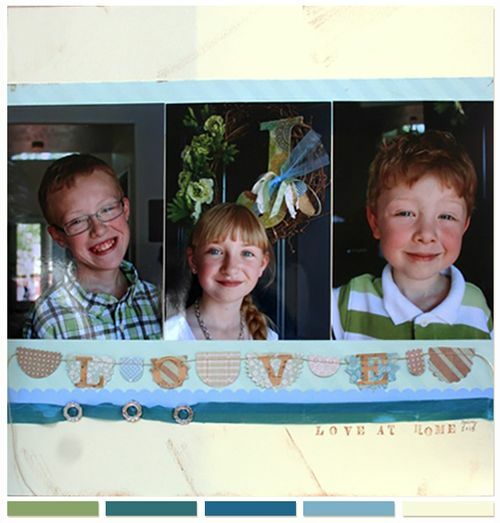 This layout drew inspiration from my colour palette, and the cottage setting where the photo and story are from. I created a patchwork design to give a country feel, and the little nautical accents were the perfect touch. September is my favourite month, as I have never lost the excitement of back to school time. I’m looking forward to stating a new class for myself this fall, and have it narrowed down to either knitting, cooking or pottery. 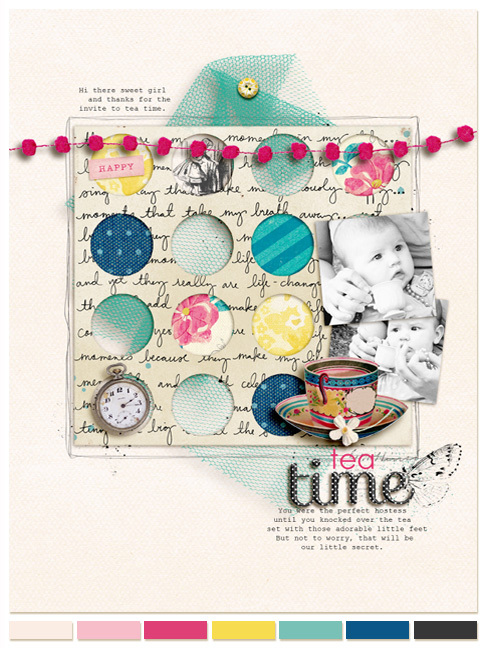 The inspiration of this layout is drawn from the little sunshine from my baby's bib. I thought the doily paper (from Crate Paper) looks like clouds. September is gonna be a special and busy month for me as that is our two year wedding anniversary. And my baby boy is turning 6 month-old in September, means I really have to learn how to prepare semi-solid food for him. I have hardly cooked previously. And I am also going to start teaching book binding lesson, so this is going to be a really fun and challenging month for me! I didn't journal much, but used subtle elements together to tell a story. My husband whistles all the time while he's working. I just happened to catch it on camera, and if it weren't for the title, I don't think you'd ever notice he's whistling in one of the photos. And the "3" card references that there's actually three of us in that tractor cabin--Lucas was due to arrive any day. 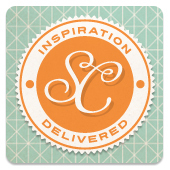 Still pinching myself--excited to join the My Mind's Eye design team this month on their blog. I love to scrap black & white photos, because I can use bright colors and white space. This time I choose 4 colors-gray,pink,yellow and tourquise and photo of my younger son. I like how the colors coordinate with photo and I like the summer mood in this LO. I like fall, but now I can’t wait for the snow. I love winter! 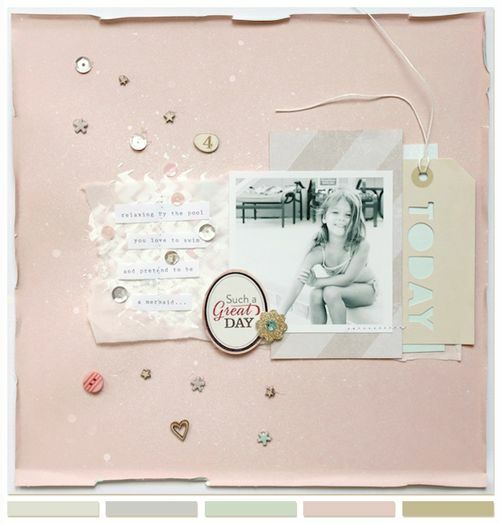 The color palette for this layout came from shopping my embellishment stash. 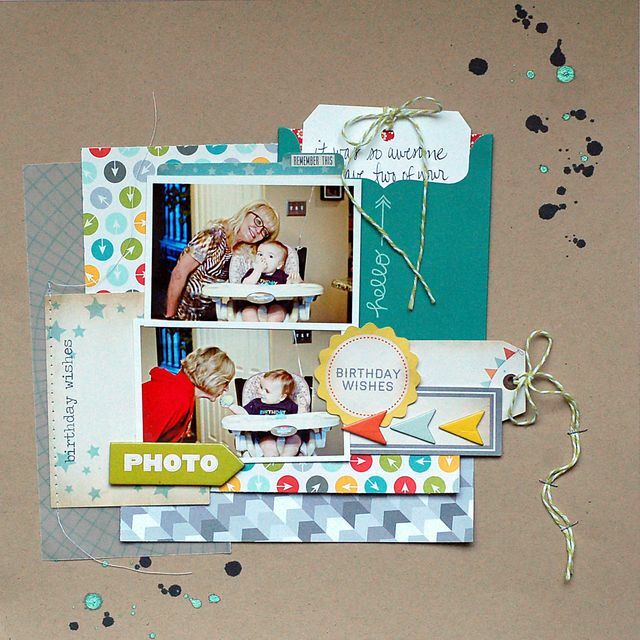 After assembling a combination I loved, I selected photos and pulled patterned papers from my color files to complete the page. The grid design provided me with many small compartments to embellish with all the supplies I had chosen. I have already printed my Christmas gift list and started handmade projects for a few people on that list. I hate doing things at the last minute. Of course I just had to pick pink in my color palette for this month's gallery. I love this beautiful "misted pink" paper from the new Dear Lizzy Polka Dot collection and knew I wanted to use it as my main color. I used a mask and some gesso on my background, as well as some gesso covered tissue paper to add a little texture and dimension. My other colors are more subtle as I wanted the pink to really be the main focus. Preschool starts back for us this September and both of my two kids will be in the same school. My daughter will be in the four year old program and my son will start his very first year of preschool in the two year old program. Boy am I looking forward to a schedule and routine again!! Our first trip to the beach this summer wasn't until mid August, and my little guy Willie was so happy! I used the Soft Tea photoshop action on this photo and the way the colors came out, with the seafoam green and touches of orange, blue, and brown, I thought it would be a nice palette for the end of summer/beginning of fall. I have an inexpensive digital underwater camera that I use to take pictures at the beach or at the pool. I never actually take any photos underwater with it, but I'm able to get up close to my kids for pictures without having to worry about the camera getting ruined of it gets wet. This layout about my niece at her very first tea party, was created using a color palette I pulled from the tea cup embellishment that I used on the page. I knew I wanted to use this embellishment the moment that I saw it and it was such a statement piece that I decided to build my entire page around it. I chose a template that would allow me to introduce a lot of different colors in an interesting way and I was lucky to find most of the patterned papers I used in one kit. I mixed these colors with large does of black in white to help the colors pop and to tie in my black and white photos. I'm finally reclaiming my studio space in our basement and am currently in the process of organizing and redecorating! It feels so great to start over fresh in new space...don't you agree?! I don't understand why this page was so hard for me to make! I use lots of color all the time in my layouts, so you would think that this would be a piece of cake, right? I was thinking too hard on which colors to use, and how that would affect the page when I should have just done a page (any page) and then thought about what the colors did or represent etc. 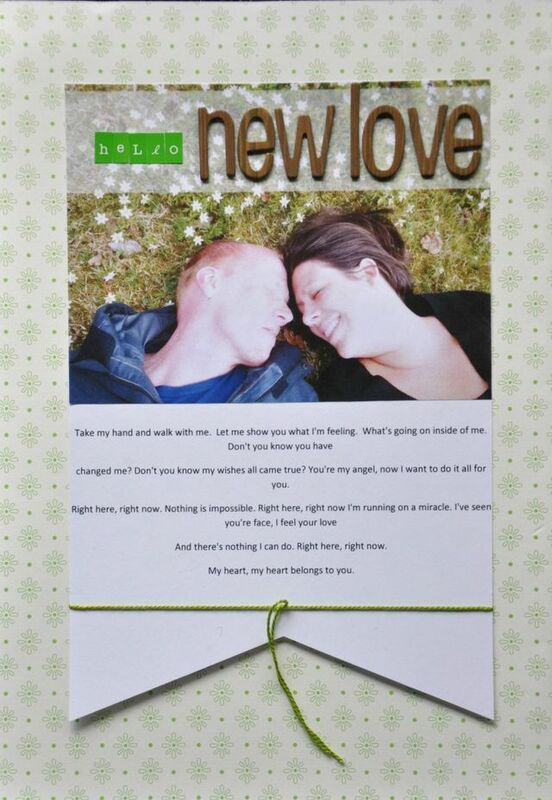 Anyway, when I was final putting the page together I first went with just green and white. But then it seemed the page was missing something, so I added a bit of pink in there and that made the trick! I just swam in the lake for the first time in 12 years! Fact: I live on an island! I used the Kuler app to select a color palette from the top photo, but I thought the colors it chose were too dark for the layout I had in mind. I was able to tweak the colors a bit until I had a more muted, softer palette. We put in our first vegetable garden since 2006. We're finally living in a place with a growing season! This layout features one of my favourite colour combos. I just love working with grey and pairing it with either yellow, orange or teal. The colours I choose were inspired by the picture and really pick up on the tones and subject of the picture. I love this time of the year, the cooler weather, the apple orchards ready for picking and all the wonderful photographing opportunities. If I had it my way it would be Fall all year round! I took my color inspiration from the wreath that was hanging on the door in the middle photo of my layout. Cream, light blue, turquoise, and light green. Perfect for the photos of my kiddos from this spring. I’m attending my high school reunion later this month (20 years! ), and I’m starting to get nervous. It’s like I’m a teenager all over again! This is one of those photos that you're in the right place at the right time with the right settings! We went to some waterfalls here in Okinawa and my youngest of course was the first one to jump on the rope to swing in the water. This month marks 16 years of marriage for my husband and I! I sometimes still feel like we just got married, even with a middle schooler in our house! 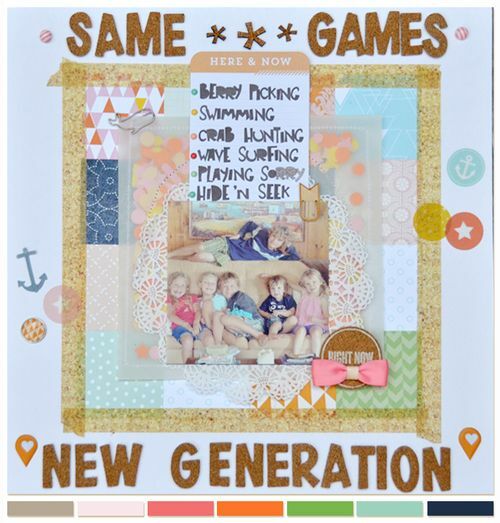 I loved the color scheme that Amy used in her post last week--those oranges, and pinks were perfect for my frame of mind and this photo. I brightened the colors up which make them a hint more perfect!! I love autumn. Love love love. The weather. The blue skies. The schedule. School clothes. The renewal. Everything about it is perfection. Before we go, we must say goodbye to one of our beloved teammates. Katie is leaving us this month. We appreciate all she has done for us: her hard work, her friendship, and her sharing of her amazing talent. Katie we wish you well and can't thank you enough for a terrific run!! Good luck in all you do! This month's gallery celebrated lists of ten. It's summertime and free time is at a premium. As we look for ways to streamline our pages and productivity, we realize that journaling is is a terrific place to do so. Let's look back through our gallery and make a list of lists we can make. This past month we all looked back to the prior year to find inspiration for our gallery layouts. Isn't it interesting to see how one layout can inspire another, but not necessarily look like it in the end?? 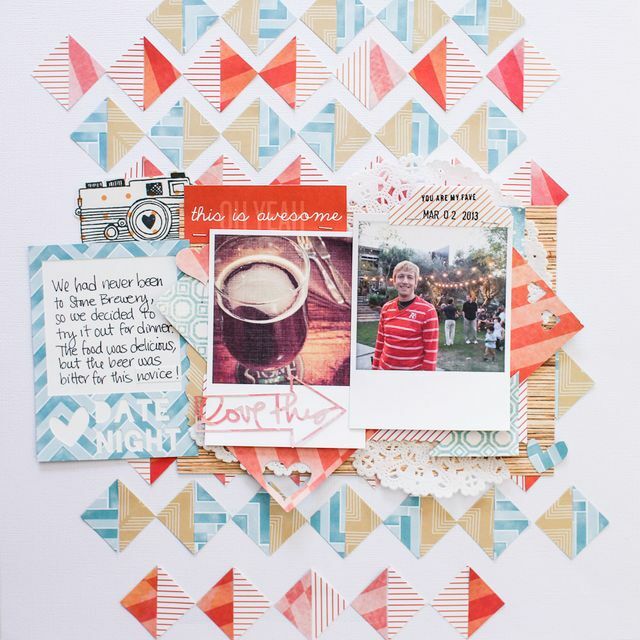 Here are the layouts and a little bit of inspiration for design, photos, or journaling. That's it! We hope you enjoyed the look back and we will see you Monday for a brand new gallery! 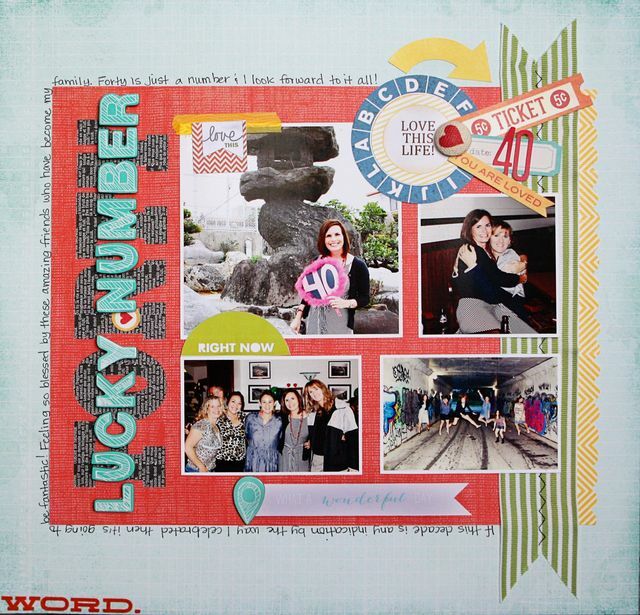 I fell in love with first and last day layouts when Jody Wenke worked her magic years ago! Paula, Kathy, and Christa made their own terrific versions here. I am happy to be a lemming when the idea is good! Here is the one I made for my baby this year! I hope you have fun putting your first and last layouts together! Please join me tomorrow for one last tip for finishing off our school year layouts! Hooray hooray hooray hooray hooray today is our birthday! We love this time of year as we get to look back at the last 12 months and marvel at the changes, the fun, and the general awesomeness of our favorite site!! We hope that you have enjoyed the posts, the layouts, and the inspiration. This month we are looking back at year four. 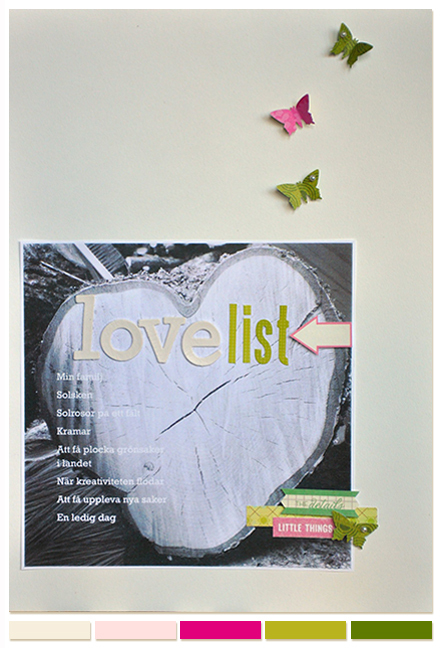 Each of our designers picked a layout or post that they loved from this past year and used it to inspire a new layout. Let's take a look. 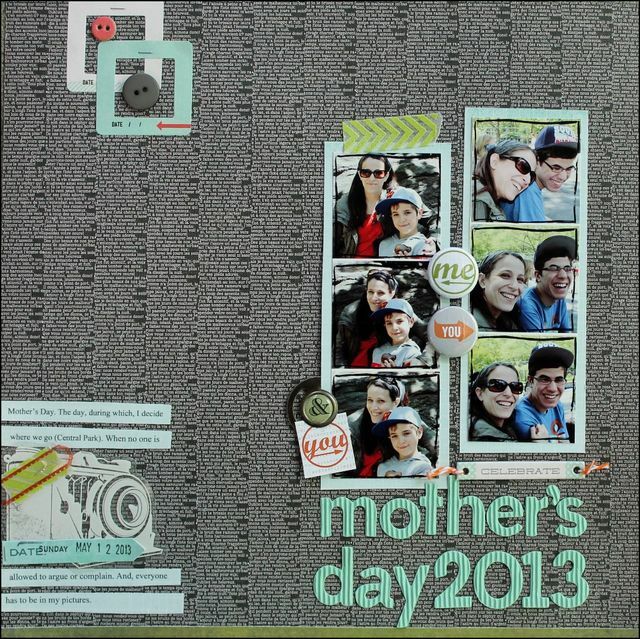 This layout was inspired by a recent Mother’s Day post by Marnie. She said that every Mother’s Day, she takes a picture with each of her children. I knew right away that I wanted to do that too, and I am madly in love with the results. I just bought a necklace that I love, but it’s really big and bold. I am working up the nerve to wear it to work. Todd and I always take Summer Solstice (6/20 or 6/21, depending on the year) off work. Our rationale is that Summer Solstice is the longest daylight of the year, and we don't want to spend it at work! We look forward to our annual tradition or spending Summer Solstice outside and together every year. Teka always inspires me with her projects. I chose this simple page because of the big journaling banner. I wrote some lyrics on my banner and added my photo on top. I added a strip with low opacity in Picmonkey to the photo before printing it, so that I could easily add my letter stickers as a title. 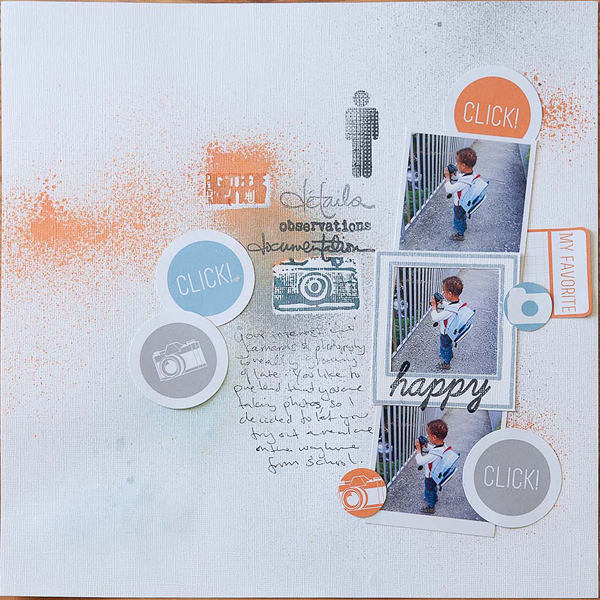 This layout is inspired by Deb Duty´s page called Happiness. Deb always makes such cool layers so I wanted to mimic that. I had the Jenni Bowlin patterned papers but felt like I wanted something more. So I began doodling and ended up making that magic paper. It was much fun and I know I will do that again! As I re-read and looked at inspiring post after post from the last year, Amy Coose's layout with stitching around her photo caught my eye. I love how it framed and brought attention to her photo. It was exactly what I wanted to do to showcase the photos that captured my daughter's loving gifts to me this Mother's Day. It may be summer and school is out but we will be busier than ever with select softball tournaments, speed camp, wrestling lessons, football practice, baby sitting and a trip overseas. It will be a full and busy month, but I love it and wouldn't want it any other way! As I went back through our amazing galleries from this past year, I was really inspired by Marnie's layoutfrom the Feeling Thankful gallery. 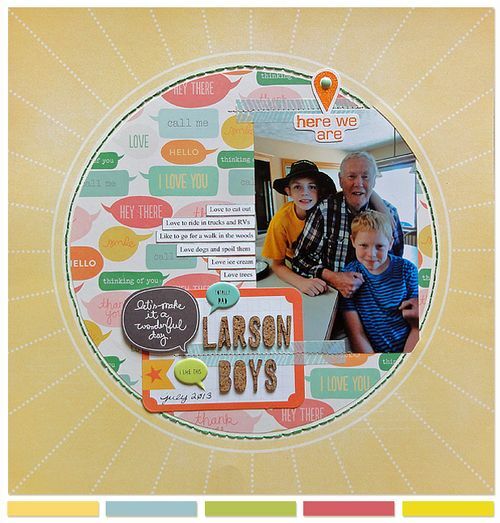 I loved the design of the layout and the sweet pictures of her kids with their grandparents, and I knew I had the perfect pictures of my baby boy with his grandmothers on his birthday, and I couldn't wait to get them scrapped. June is a busy month for us. We have the last day of school, my birthday and my daughter's birthday the day after, and we also usually travel home to see my family. I wait all year for this month, because it's filled with so much fun. 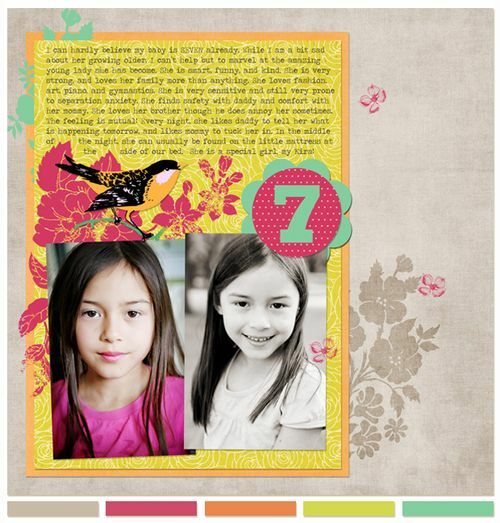 This layout was inspired by Valerie O’ Neall’s The Many Faces of Lucas layout in the Five is Fun gallery. I don’t work during the summer and I can’t wait to spend all day lazing around the pool and scrapbooking at night! Amy Sorenson's recent Silhouette Week was super inspiring. While I can't really use my Silhouette to scrapbook digitally, I can still bring the look to my pages by using the .png files to clip papers to and shadow to get the same look. I'm excited for school to end. Both boys will be going to sleepaway camp this year the same week. It's going to be fun for them, but I'm sure too quiet around here! 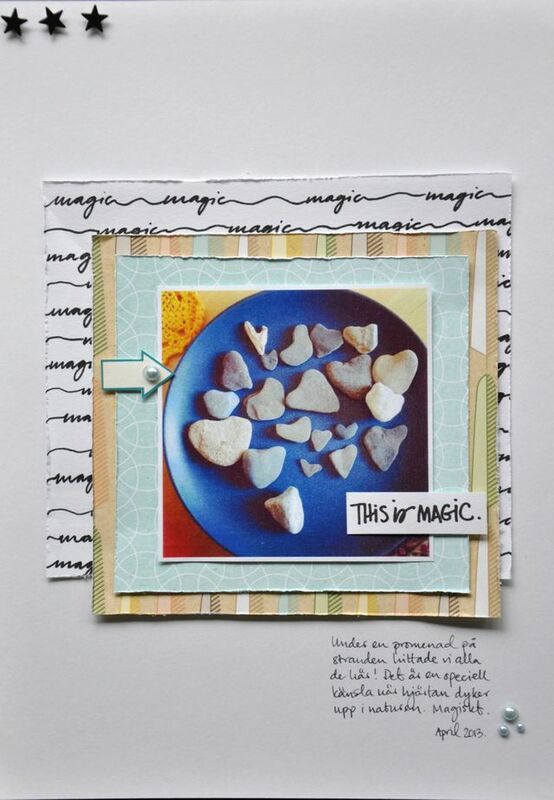 I took inspiration from a post by Amy Coose back in February about using your stash, specifically stamps for a background. I took a Polaroid stamp I had and stamped a background of Polaroids to serve as a photo mat, filling in the centers with patterned paper. This was a quick but eye catching design! I have a collection of Noah’s Ark pictures, figures, and cross-stitched samplers. I took my inspiration this month from a Click post. I think it’s very important to take photos of ourselves as moms and not just let them sit on the memory card and/or computer, but also putting those on paper and scrapbooking them. I wanted to document my recent 40th birthday to embrace it! This month marks our 1 year anniversary of living overseas in Japan. We have had lots of adventures so far and looking forward to many, many more in our short time here. This month we head off to explore Seoul, South Korea. 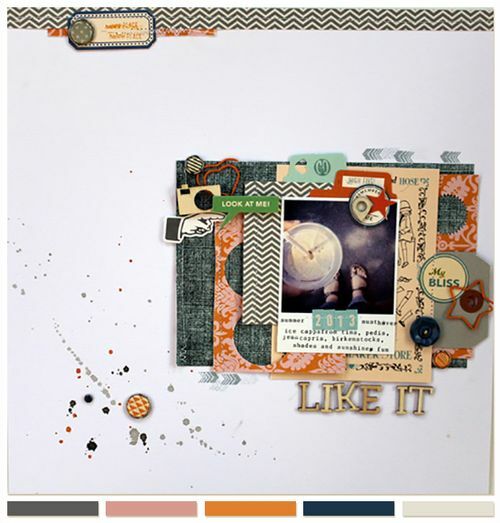 This layout was inspired by Diane Payne's embellishment week back in January (1.28.13-2.1.13). I couldn't pick just one type of embellishment, so I used almost all the embellishments mentioned throughout the week. I actually enjoy repainting rooms in our home. Now the ceilings? not so much (and thanks to roof leaks, I've had to repaint almost every ceiling in our house). I love pretty much everything that Valerie does, and I especially loved her layout from the Conversations gallery in February. It got me excited about inking and stamping! 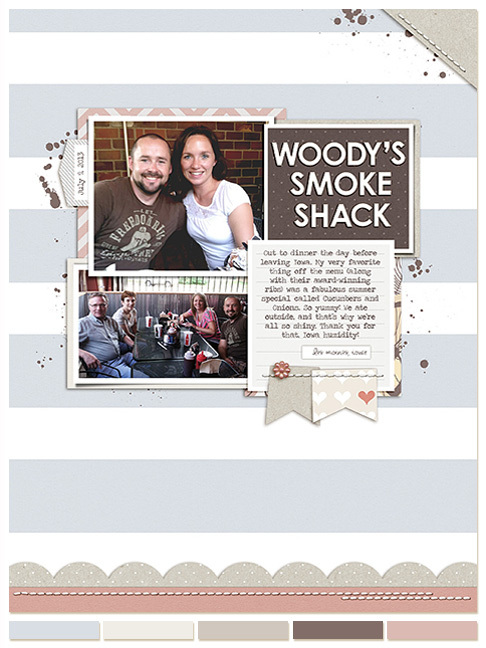 I also used the free printables designed by Marnie for the Favourite Photos theme last December. They went perfectly with this month's theme AND my layout. Without my notebooks, lists, post-it notes and wall planner I wouldn't remember a thing! Celeste is my hero. 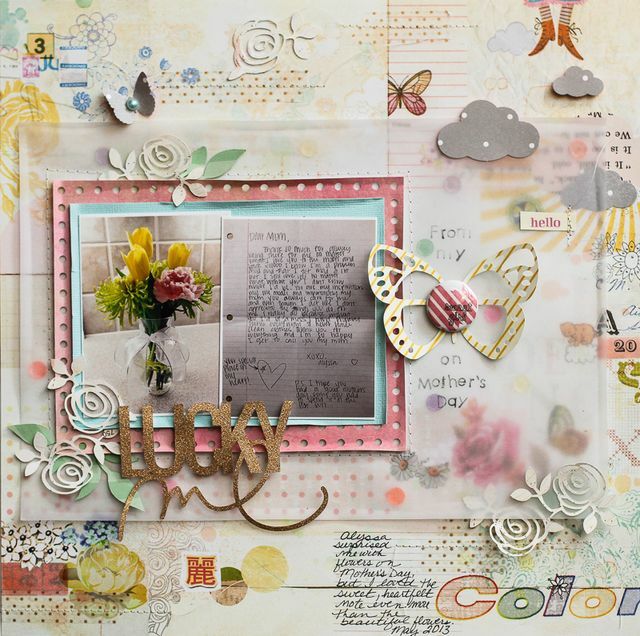 She is one of the most consistent scrapbookers alive. 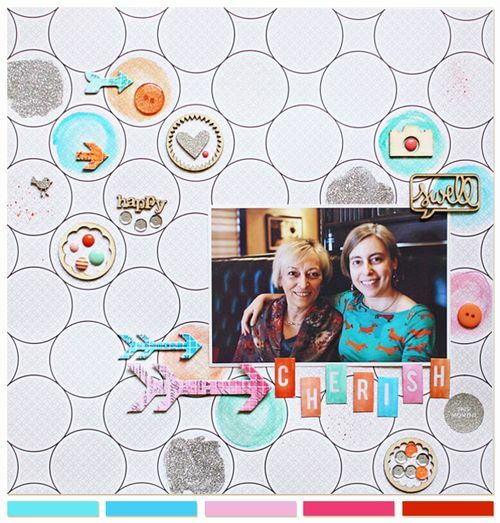 As I hunted through her year 4 layouts, I found this one with its place for flair and tiny patterns. I love how quickly it all came together. Maybe I should just copy all of Celeste's layouts!!! We just got a puppy!!!!!! I'm a big sucker for Francine's layouts. This one with it's grid was too perfect to pass up. I loved the two fonts on the edge, but couldn't get mine to work. But I wish I could have. We finished school in May this year, so June is all about the fun fun fun! Christine is so incredibly talented. 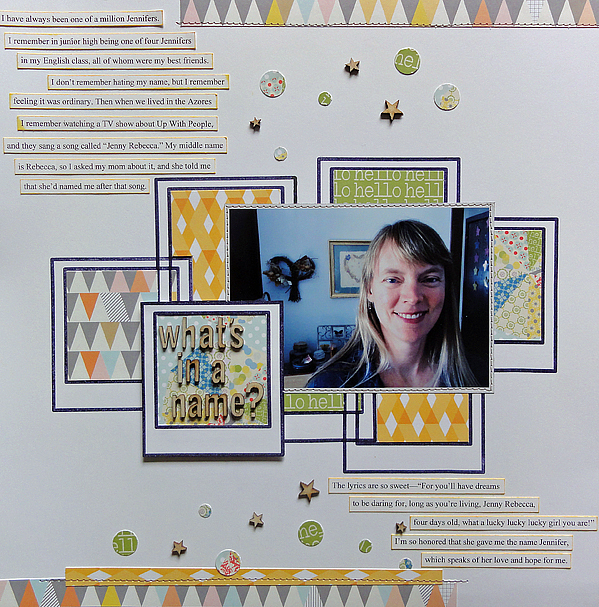 When I saw her layout in our November gallery, I was taken in by the mixing of patterns and how cool it looked with the patterns and colors. Did I mention we got a puppy? We love her. Her name is Chartreuse Rosabelle Starlight. But we just call her Charlie! It's a terrific gallery, no? If you would like to see the gallery as a whole, you may do so here. And there you will find all the journaling, too! Thank you for joining us for our birthday! Have some cake for us and raise your glass to another year of scrapbooking together! We love you, dear readers! We love you!! Happy birthday us! With just one week left this month, it is that time again. That time where we take one last look at the gallery before we celebrate a new one. Shall we begin? This month we celebrated all things daily. Routines. Repeat adventures. The tedious. The average. The little things that fill our days and our lives. To make our lookback more educational, we have included a tip that you can use to help you better understand what makes a great page. We hope you enjoy the last look. 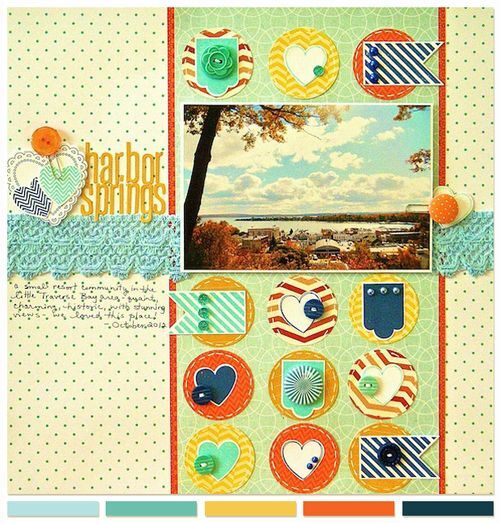 Welcome to our May edition of scrapbook! Saturday. I am having a wonderful month here at write. click. scrapbook. How about you? This month's gallery is a favorite of mine. 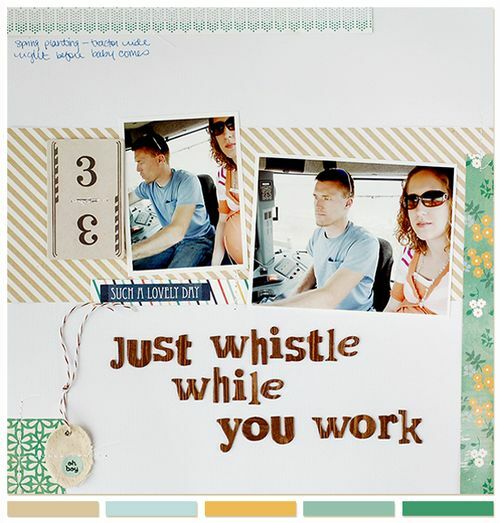 I love the reminder to take time to scrapbook our daily moments. Those times in between the events that used to dominate our scrapbooks. I hope that you have felt inspired, too. For our three scrapbook! challenges we are going to go back to our May gallery, Everydaily III, and find three inspiration pieces. Ready? 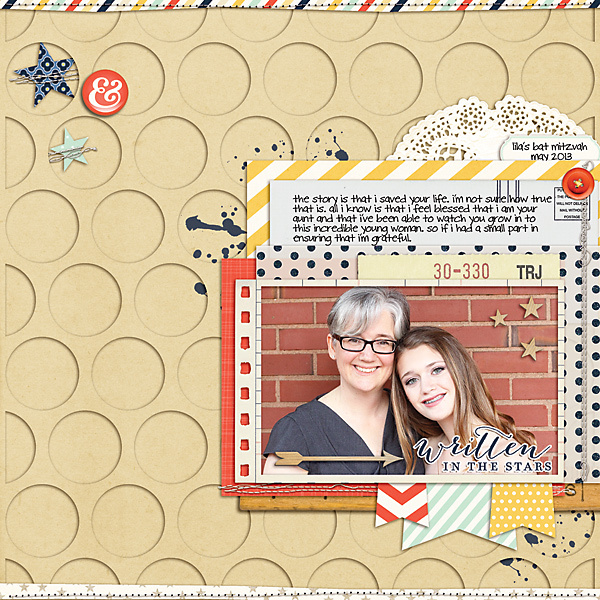 This month, Diane created a sketch based upon Amy's layout, Everyday He, in our Everydaily gallery. I love the tags and the details and that it has matching photos. I couldn't wait to use it. But first, let's look and see how two of my teammates took it on. Jennie's layout chronicles her yummy doggy. She stuck closely to the sketch, but switched her journaling box to one sized more like the tags on the side. I love the little red sequins. Mmm. Diane's layout is going to make you smile!! Her choosing a faux corkboard was so smart. And the pearl tops look just like push pins. Genius! This makes my heart happy. The happy smiles and mugging for the selfies are too too fun!!! Thank you, Diane, for the sketch this month! If you would like to download a layered template you may do so here. Please leave us a comment if you take a turn with the sketch so that we might see your good works! is based upon Christine's layout, Love to Run. With all those luscious pinks, I couldn't resist. Here is what I came up with. I know the pink is bright and central, but the other four colors are there. And helps to take a bit of pep out of the peptol bismol bright!! I can't wait to see what you do with this palette. There are so many ways to go with it. I'm looking forward to seeing yours. This month nearly every layout in the gallery has a color photo. Well, except mine. So I thought perhaps I should join in! And while we were doing color, I thought I would go for broke with a color filled background paper, too! And don't forget to let me know if you make a layout or two!